Super Car Wash is a private, family-owned business committed to maintaining our high standard of quality and continuing to deliver the type of excellent customer service we are known for throughout the Detroit metropolitan area. Since our first location in 1977, we have owned and operated 22 different car wash locations. 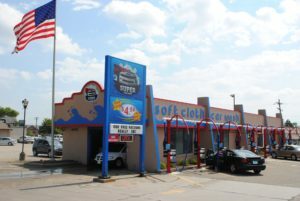 Led by George, Todd, and Ryan Gesund, along with Heath Stack, Super Car Wash, now with 9 locations, annually ranks in the “Top 50” car wash locations in the United States. Super Car Wash has continually updated our services to make sure we are on the leading edge of the latest technology. Each Super Car Wash is equipped with the most advanced, state of the art car washing equipment and technology available. We use biodegradable Simoniz and Armor All chemicals, gentle soft cloth, touch-less air dryers, and energy-efficient computer-controlled equipment. Then, just to make sure your vehicle looks great, we finish it off with a personal hand towel dry from members of our friendly staff. Not to outdo ourselves, but then we have the latest, and greatest, Free Express Vacuums for all of our customers to enjoy. It is truly an experience at Super Car Wash.
A super savings program for any business owner with a fleet of cars, trucks, or vans! We offer customized fleet discounts tailored to your business based on estimated monthly wash volume. You wash your vehicle when needed, and your company can pay later. Each company car will be assigned a barcode sticker, which will be scanned upon entering the wash. This will allow your fleet to be easily tracked without any unauthorized washes on your account. You will be billed on a monthy basis, and will receive an invoice from us at the end of each month. We can set up this program for only one location, or multiple locations. Please e-mail Todd Gesund (President) today at [email protected], or call us at (248) 549-6770 so we can register you in the Corporate Accounts Program as soon as possible. Super Car Wash is highly committed to our local communities. We donate to many different organizations and causes. We also help local schools and other organizations with their fundraising efforts. We make it as easy and convenient as possible. We are always happy to help schools and organizations meet their fundraising goals. Super Car Wash, an industry leader since 1977, commits to provide fast and friendly service to the people who mean the most, our customers, at a good value, using state of the art technology to ensure a clean, dry, shiny vehicle.